This class provides a fun, meaningful and relevant playful learning experience for young children. We provide materials and activities that lay the foundation for *S.T.E.A.M. learning. Children will learn concepts and practice skills through hands-on exploration and play, such as creative problem solving, critical thinking, self-regulation, pre-math and science, sensory experience, construction and more. We provide experiences with blocks and loose parts, process oriented art, sensory and science, dramatic/pretend play, and language and literacy, and more. For children 15 months to 8 years old. This sensory and science class will thrill your young children. They get to explore a variety of materials with their senses. They will explore slimy things, ooey gooey things, wet and dry things, rough and smooth things and more! They will experience chemistry and physics as they play and explore the natural materials provided. Things will go fizzle and pop, things will go fast and slow, things will roll and fly! 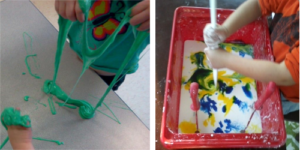 Children will learn concepts such as absorption, displacement, measurement, cause and effect, sensory and tactile awareness, solid, liquid, suspension, drainage, conservation, volume, mass, saturation, estimation, and the learning goes on and on. For children 15 months to 8 years old. This process oriented art class is so much fun for young children. Not only do they make beautiful works of art, but they will explore STEAM (Science, Technology, Engineering, Art, Math) concepts through the process. They will make art by using catapults, bouncing and throwing, rolling and shaking, gluing and pasting, blowing and pulling, whacking and smacking, sticking and stacking, and more! 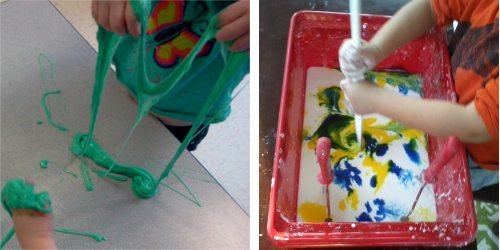 Children learn: pre-writing skills, fine motor skills/ hand-eye coordination, color identification, saturation, patterning, color mixing to make new colors, creativity, symmetry, negative/positive space, cause and effect, and the learning goes on and on. For children 15 months to 8 years old. 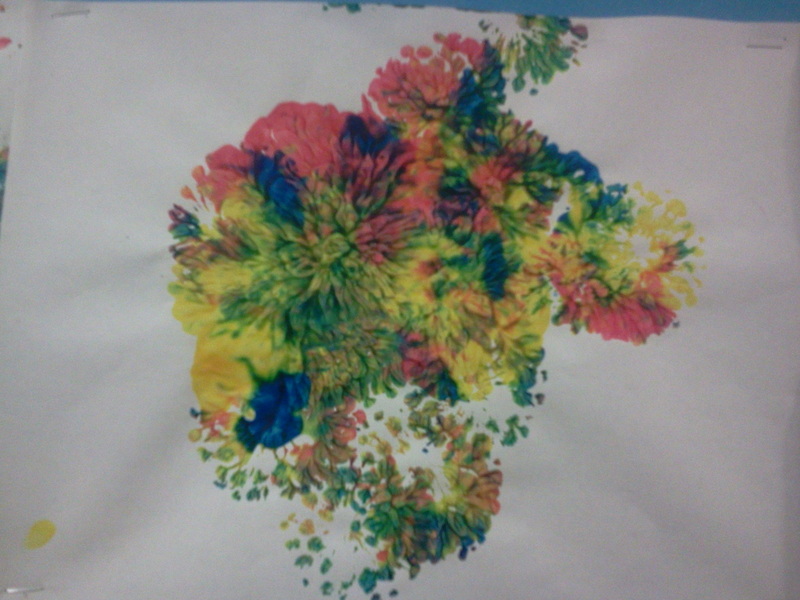 This process oriented art and sensory class is so much fun for young children. Not only do they make beautiful works of art, but they will explore STEAM (Science, Technology, Engineering, Art, Math) concepts through the process. 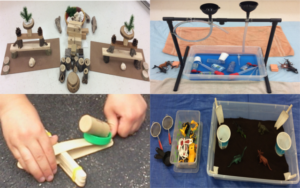 They will make art by using catapults, bouncing and throwing, rolling and shaking, gluing and pasting, blowing and pulling, whacking and smacking, sticking and stacking, and more! They get to explore a variety of materials with their senses. They will explore slimy things, ooey gooey things, wet and dry things, rough and smooth things and more! It will be so much fun, so please dress for the mess. For children 15 months to 8 years old. Loose parts play can make the imagination soar! Your youngsters will use their creativity, critical thinking and problem solving skills to… well, do whatever their little heart’s desire with the materials provided. Loose parts are “loosely defined” as anything that you can move, carry, line up, combine, take apart, put together, arrange, and so on. “Stuff”, “junk”, “things”, etc… There are infinite possibilities with the open ended nature of loose parts play. Loose Parts play is inclusive; children of any background and any level of development and skill can be successful. There is no right or wrong way to use them. 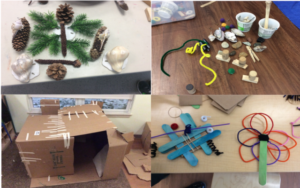 Children will discover multiple ways to use the materials, new ways of thinking and processing knowledge, while engaging their curiosity and having fun. Loose parts are THE PATH to innovation in young children! Join us! For children 15 months to 10 years old. 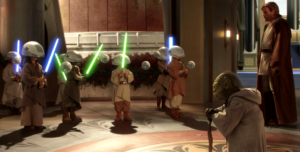 This Jedi Training class mixes reality and fantasy, mindfulness and meditation, and seriousness and fun! Your little padawans will learn the skills necessary for a Jedi. They will learn to focus and clear their minds, to concentrate and “feel the Force”. They will practice self-regulation and emotional regulation skills. They will learn how to respond, not react. They will learn basic lightsaber skills, and gain mastery over their bodies. They will also construct their own lightsaber! This class teaches mindfulness skills and meditation, arts and crafts as we construct our “lightsabers” from everyday household objects, and self-discipline as we practice with our safe, soft, pool noodle “lightsabers”. For children 4 to 10 years old. Sign up on the web here!